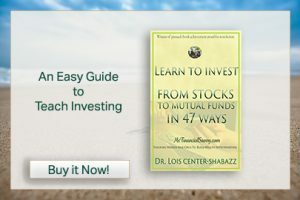 Women need to understand investing now because there are no guarantees you will stay married or even get married, women need to know how to take care of their finances. That means they need to understand sane savings (my mantra), mega-money management (because everything is ultra-expensive), and investing (because you need to stay ahead of inflation to keep your money growing). Far too many women are still taught to be financially dependent, even when they work, and many don’t get involved in family finances since they feel prince charming will be there to protect them forever. It is important to work together on finances, and staying out of family finances could have dire consequences either spouse. Because you have at least a 50% chance of divorce and even greater chance of being separated from your spouse, it is imperative that you understand all the nuances of money, including investing. If you are not dependent on your husband to take care of all finances during your marriage or an adviser if you are single, then you will know what to at any time, including with an illness, accident, or death. Many women fall victim to con artist who prey on women with money and no financial skills, because they are not familiar with the ease at which others prey on those without financial experience. There are literally millions who have lost millions due to being trusting and naive. Don’t make yourself a victim by keeping your financial knowledge and skills very low. The potential for divorce or death from a spouse are a major reason why women need to understand investing. There are many women who never write a check or pay a bill, when they are married. That is hard to imagine, but it exists. Writing checks and paying bills are a powerful way to keep yourself aware of family finances and the limitations of money. Then you monitor investments in mutual funds, or other investments for savings, college, or retirement, this gives you another layer of awareness and will help protect your finances now and in the future. Therefore, women need to understand investing. Social security is meant to be a supplement, that is why the payout is very low for most people. When you understand investing, the chances are good you will also understand how to grow your investment retirement account and hold on to the accounts build by you or your spouse. Understanding why women need to understand investing will create an entire class of new and capable investors, who can also teach their daughters. Get your 3 free gifts to get started now.